Probably the healthiest chips around. 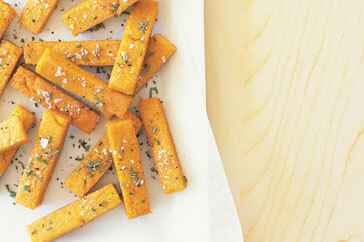 Give this recipe a go and be surprised at how easy and tasty these chips are. Before startin line a shallow baking tray with greasproof paper giving it a good lick of oil. 1. Bring your water and stock to the boil. 2. Whisk your water and pour in the polenta bit by bit, constantly stirring. 3. Turn the heat down and keep stirring until the mix comes to a texture the same as a thick porridge. 4. Pour the polenta into the tray evenly spreading it out and allow it to cool. 5. Once cool, get a non stick pan on the heat while you cut your polenta into chips. 6. The trick behind making the chips is to place them onto a very hot pan and give them a good 10-20 seconds before attempting to move them. They should naturally come loose from the pan once they are nice and crisp.